What are direct payment programs? Direct payment programs offer landowners an incentive, such as a cash payment, in exchange for implementing specific conservation practices on their land. The concept originated after the Dust Bowl swept through the Great Plains during the Great Depression. The government established the Farm Security Administration (FSA) in 1937 for the purpose of promoting soil conservation and getting farmers back on their feet. Farmers were incentivized to try out new methods of farming in order to protect the soil from erosion in the future. These programs were the foundation for modern direct payment programs, such as the FSA’s (renamed the Farm Service Agency in 1994) Conservation Reserve Program (CRP) and payments for ecosystem services programs that financially compensate landowners for managing their land to achieve specific outcomes. In some watersheds in the Pacific Northwest, landowners have the opportunity to receive payments for restoring forest along their properties’ riverbanks. The goal of these programs is to provide shade to block the sun’s warming effect on the river and offset impacts from warm water released by local wastewater treatment plants. The concept was originally developed in the Tualatin River Watershed outside of Portland, Oregon. Here, the local wastewater utility, Clean Water Services, faced the challenge of meeting regulatory obligations under the Clean Water Act in which temperature is a regulated pollutant because of the impact of elevated stream temperature on salmon and trout. To meet this challenge, Clean Water Services worked with the FSA and the local soil and water conservation district to modify the region’s Conservation Reserve Enhancement Program and fund restoration projects that improved stream temperature. Landowners received lease payments for the restored area of their land and Clean Water Services received credits that they could use to mitigate the temperature impacts from their treatment plants. Working with the Oregon Department of Environmental Quality, The Freshwater Trust and The Willamette Partnership expanded on this concept to address stream temperature challenges in the Rogue River Basin where the city of Medford faced the same problem as Clean Water Services. The collaborative effort funded the program through a $6.5 million investment from the City of Medford, as well as a $1.5 million dollar grant from the U.S. Department of Agriculture. To date nearly four miles of streamside forests have been replanted and partners anticipate more than doubling that accomplishment in the coming years. Perhaps more importantly, by setting standards for thermal credits, this program hopes to influence state regulators so that similar programs can be expanded throughout the Northwest. The Clean Water Services and Medford examples demonstrate how direct payment programs can provide incentives to landowners for taking conservation actions on their land. "To date nearly four mile of streamside forests have been replanted, and partners anticipate more than doubling that accomplishment in the coming years." 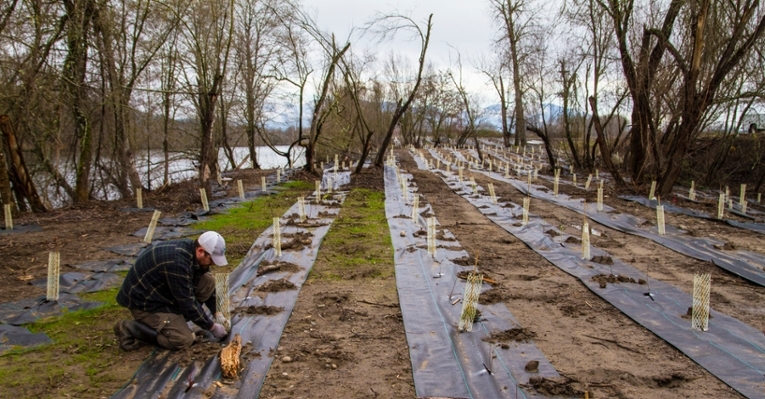 A man plants trees on the bank of the Rogue River for water quality credit trading programs. Photo: The Freshwater Trust. Kroeger and Casey. (2007). An assessment of market-based approaches to providing ecosystem services on agricultural lands. Ecological Economics, 64, 321—332.